Cutting Edge Issues in Development – Fighting for breath: Why is the world failing to tackle the deadliest killer of children? 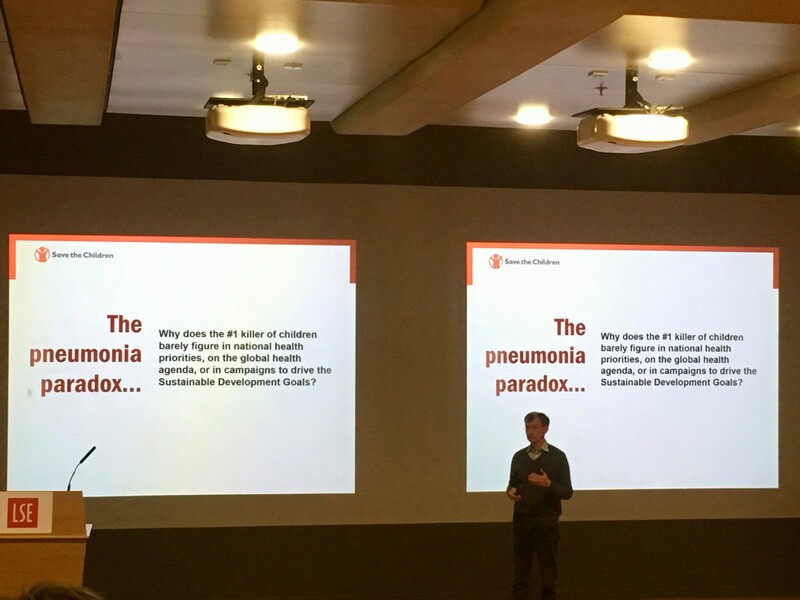 For the International Development Department’s Cutting Edge Issues in Development lecture series last Friday, Kevin Watkins of Save the Children gave a compelling talk about one of the biggest killer of children: pneumonia. Read about what two of the Department’s students thought about his lecture. Kevin Watkins, Chief Executive of Save the Children, starts his lecture, “Why is the world failing to tackle the deadliest killer of children?”. When asked to name the biggest killer of children under five in the developing world, most people – myself included – would answer malaria, diarrhea or malnutrition. Watkins’ first lesson is that despite what global health campaigns, funds, and agendas would have you believe, it is in fact pneumonia. Understanding the political economy of health priorities is critical to eliminating this paradox. In the case of pneumonia, Watkins presents three main concepts that shape health service: provision, policy and priorities. Firstly, national health priorities reflect middle-class, urban demands, creating political signals that leaders respond to by skewing health budgets in their favour. A disease that crosses social boundaries or threatens economic growth is therefore a risk to these more powerful segments of society, pushing it higher up the political agenda. Pneumonia is not perceived to present such a risk. Taking Kenya as an example, Watkins demonstrates that pneumonia victims are disproportionately concentrated among the poor, rural areas, and children under the age of two, with background factors such as malnutrition, poor housing, remote location and lower vaccination rates exacerbating the risk. Second, concerted global and national action on HIV/AIDs, for example, is often prompted by economic factors as it concerns the adult workforce as well as children. Thirdly, donor priorities attach significant weight to ‘quick-wins’, and among the international community, the threat of cross-border epidemic risk. Pneumonia cannot be prevented by the ultimate global health ‘quick-win’ immunisation, nor is it perceived as a threat to the populations of developed nations. With this comes the second most pressing lesson of the lecture – it’s time to throw out ideas of horizontal vs. vertical approaches, and instead start connecting the realities of this disease to health system failures. Creating the right incentives for low-cost, universally available vaccines is a key part of the universal health coverage approach to tackling pneumonia. But the vastness of the challenge, and the transformational systemic change it implies, may explain the ‘international neglect’: “ultimately, it’s about politics”. Universal health coverage is a concept that no one can argue with, and it fits nicely into campaign narratives, but so far, “campaigning and advocacy around health and the SDGs has ducked the power issues at the heart of the pneumonia challenge”. Therefore, Watkins calls for “campaigning by communities, for communities”, pushing political leaders to breathe new life into a more progressive, accountable and equitable universalism in public health systems. Gloria Diamond is an MSc Development Management student at LSE, and a graduate of the University of St. Andrews with a BA in Arabic and French. Gloria’s primary research interests include the nexus between education and development, as well as gender mainstreaming within public policy and social inclusion. If you asked me before Friday’s lecture what the number one killer of children is globally, I may have said malaria or diarrhoea. Yet, as many in the audience were surprised and saddened to learn, the leading infectious cause of death in children under five is pneumonia. A disease which conjures up an image of elderly people in developed countries, pneumonia is hardly on the radar of donor agencies and large health organizations. 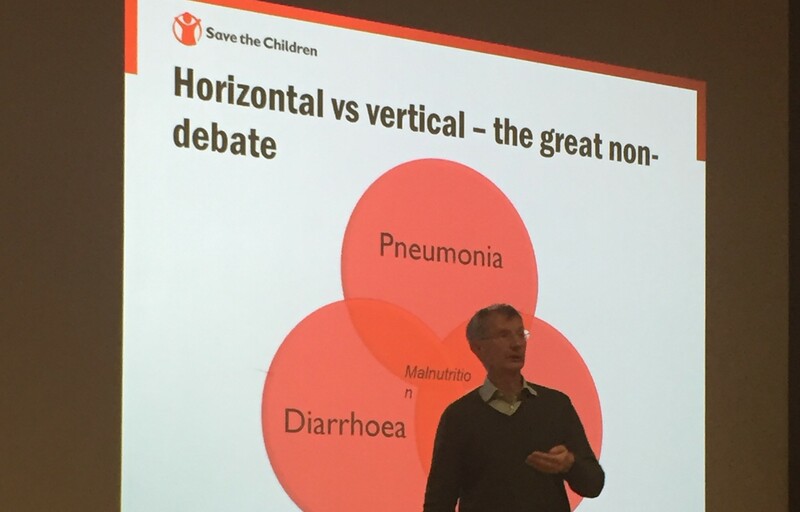 Kevin Watkins – Chief Executive of Save the Children UK – presented a compelling talk about this problem, or what he calls the “Pneumonia Paradox”. Why, he asks, does the #1 killer of children barely figure in the national health priorities, on the global health agenda, or in campaigns to drive the Sustainable Development Goals? Watkins spoke of the disease on a personal and visceral level. He described visiting health centres in Northern Kenya where 12 children had pneumonia and there was only one leaky oxygen canister for treatment. He showed a video of a child in South Sudan having trouble breathing, reminding us that it isn’t something abstract. Pneumonia is often inaccurately diagnosed as malaria, he explained, which can lead to ineffective treatment. Watkins posed important questions. What does it mean for a child to have pneumonia in a health system that fails them? If it’s so easy to fix, why has nobody done that? Global health funding is inherently complex. While funding has increased in the last 30 years, much of it has gone to disease-specific health programmes – or “vertical” interventions – rather than “horizontal” health system improvements. Pneumonia’s victims are predominantly under the age of two living in remote areas, the infection doesn’t traverse social boundaries or borders, and it isn’t a threat to economic growth. This combination of factors, as Watkins explained, has unfortunately led to international neglect. While he asked a number of pertinent and difficult questions, Watkins didn’t leave the audience feeling helpless. He instead presented a multifaceted solution to drive a breakthrough on the disease. He believes that we need to increase awareness of pneumonia, that every high burden country should have a financially-backed action plan, and that donors need to put pneumonia on the map. Watkins argues that we need a “diagonal intervention” that targets pneumonia from all angles. He notes that amoxicillin – the drug used to treat pneumonia – should be included in medical donations, and is hopeful that this can be delivered through organizations such as Every Breath Counts. Importantly, Watkins showed how 5.3 million children’s lives could be saved from pneumonia by 2030. As he poignantly stated, “the prize for getting this right is enormous”. Mara Moettus is an MSc in Development Studies student. She holds a BA in Geography from Middlebury College in Vermont and was a Fulbright Scholar in Latvia prior to studying at LSE. Her research interests include education, demographics, gender, geopolitics, and post-Soviet societies. Next up in the series: On Friday, 8 March, James Walters of the LSE’s Faith Centre will be speaking on “Faith and International Development: Beyond Secular Assumptions”. The lecture takes place from 4-6pm in the Sheikh Zayed Theatre in the New Academic Building. The series is open to LSE Students and Faculty. Other external guests should visit https://bit.ly/2AxvWVG to reserve a seat. Awesome blog. It sound’s quite interesting to read this post.